Cloud Gate, is one of the most talked about and a ‘must see’ sculpture by the artist Anish Kapoor. This is shiny, elliptical magnanimous sculpture is at the Chicago Millennium Park of the United States of America. The beauty of this reflective sculpture is the scale, the geometric shape and the material. The composition of this is more than just a mere sculpture but an engaging artwork which involves participation. Anish Kapoor is an Indian born British sculptor lives and works in London. He has created a variety of site specific and some commissioned sculptures across the globe. To name a few of them the Mountain in Toronto, the Sky Mirror one of which is in Kensington gardens of London and the other at the Rockefeller Center in New York, turning the world upside down in Jerusalem. The Cloud Gate or the Bean more commonly known was one his first ever public sculpture made for the United States of America. His most recent and controversial sculpture was the Dirty Corner at the Versailles in 2015. 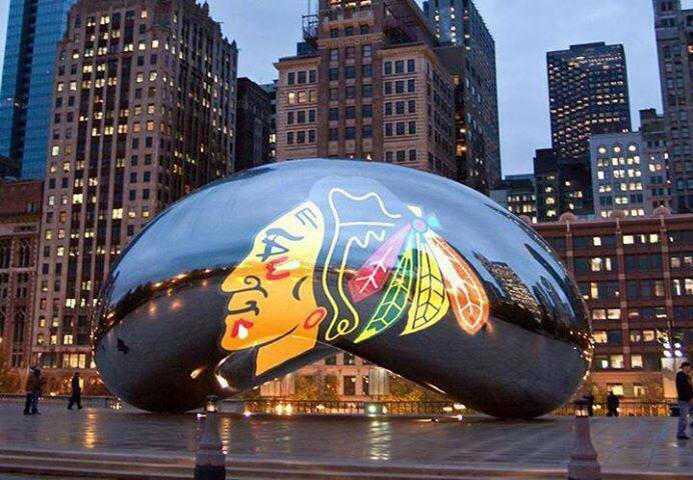 The Bean is positioned at the north east side of Chicago’s Millennium Park and near the lakefront of the Grant Park. This was unveiled on July 16, 2004 and was officially dedicated on May 15, 2006. This massive sculpture is constructed out of one hundred and sixty eight stainless steel plates that have been seamlessly welded and is polished to appear like a mirror. The dimensions of this artwork are sixty six feet long, thirty three feet high, forty two feet wide and weigh one hundred and ten tons. This was fabricated over a fortified steel frame which is hollow in the interiors. The Cloud Gate was constructed in California then taken apart shipped and then re-assembled in Chicago. Over time this has now become an iconic structure and emblematic to the city of Chicago. 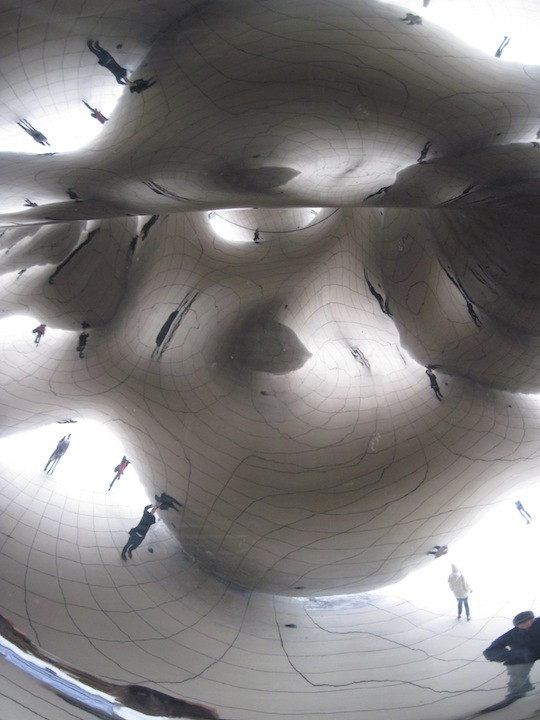 The shape of this almost circular concave bean has a hollow space below allowing the visitors to walk through it, touch the structure and experience the fun mirrored images of one self. Not only from below but with linear perspective when the people see this massive work the shiny mirror reflects back multiple distorted angles of themselves which is almost like a play. Photographers have taken some amazing shoots of this artwork during different seasons and hours of the day and night which raised questions related to copyrights of the images at public spaces. The Cloud Gate has a panoptic view, its geometrical shape and steel effect imitates the city’s vastness and beauty within it. The polished surface serves as a mirror and the when one walks underneath it which is like a concave chamber and the reflections gets multiplied. Often people term it as the belly button. 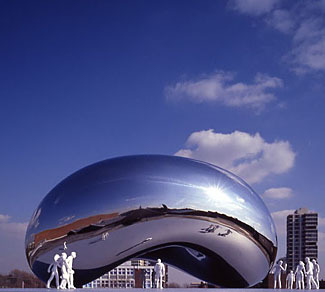 Kapoor calls it Cloud Gate because eighty percent of the surface of this sculpture reflects the sky. He sees this work as an intersection between sculpture and architecture. Cloud Gate is an iconic piece representing the cultural value of the city in the public space. The state recovers the expenses of maintenance through parking fees. There are some interesting facts about this site specific sculpture; the most bewildering fact is the cost, which was estimated for nine million dollars but the project complications increased to twenty three million dollars. Moreover, earlier it was to be the centrepiece of the Lurie gardens but was moved as the park planners were afraid of it being tarnished and damaged by the heavy tourist traffic. Forty gallons of liquid Tide is used to wash it twice a year to maintain this colossal steel artwork. 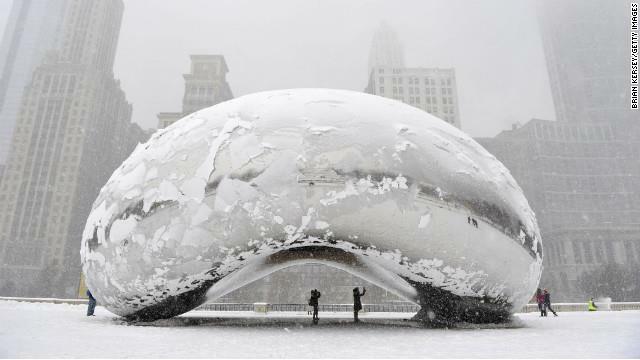 After the opening at the Millennium Park in 2009, the Bean was vandalized by two people who carved their names on it. While studying some basic principles of public art in an open ground some questions come forth, does public art in the public space must encapsulate certain norms or requirements? Should it be evaluated as an iconic object and symbolic to the city, if so who decides? Does the public have the freedom? Scholars and admirers consider that it should be beautiful and should be a piece of enjoyment to eyes or to the city? Iconic monuments and structures often play with the memory of the visitors and after having viewed it should be lasting, does this happen with all sculptures, paintings which are in the open realm? Artworks should encourage participation of the viewer and allow dialogue as many artists feel. Do public works encourage positive dialogues or raise controversies? Are these issues then addressed? Does the selection of the committee coincide with the public, or should they have the public in their committee to help selection? What are the expectations of public art in terms of painting, sculpture or monuments? Is the public open to non- traditional materials? How does one eventually satisfy the public for the costs and the taxes paid by them? This example of Cloud Gate does answer many of the above questions and also leaves room for some to be answered and open to interpretations. Luftwerk, a group of two artists who transformed this space for ten days with music and lights making the space more interactive and added more glam to the site. The space around the Cloud Gate got lighted and gave a different perspective to the senses. This additional layer to an existing artwork made this site more enigmatic. In the ten days it attracted a crowd of sixty five thousand Chicagoans and tourists. This project was called ‘Luminous Field’. Some may consider this as a distortion to the existing space and some appreciated this transformation of the space. Artworks in public spaces are for public so can it accept modifications to its origin form? Personally, I appreciated this new alteration of this space as it allowed the malleability of this artwork by not destroying its original form. It just added more beauty to the surrounding and the curiosity attracted more visitors. The beauty of the dramatic neon lights reflected the splendour and the versatility of the Bean. This media installation of light, sound and play made this space a ground for enjoyment as it encouraged interactivity not only with the artwork but with the entire space. To conclude this artwork opens the mind to more avenues of communication and play of contemporary public art in public spaces than art which is at a museum or a gallery space. The aesthetics of public art entails the freedom and the manipulation of the public space along with the viewers.